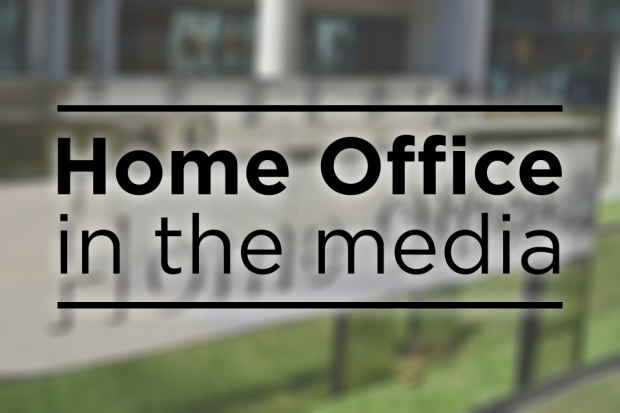 The main Home Office stories in the media today relate to the arrests of three Britons in Calais who allegedly tried to fly four illegal immigrants into England, coverage of BBC analysis which shows that many criminal investigations are left unsolved, and the publication of the Mouncher report. There is widespread reporting that three Britons are in custody in France after trying to fly four illegal immigrants to England. The reports all say three men were arrested at Marck airfield near Calais on Monday, with prosecutors reported as saying that it was the first time they had dealt with an attempt to smuggle migrants by air. The response to all queries on this specific issue would be handled by the National Crime Agency. For more information about our approach to border security, please see our fact sheet here. The Times reports on BBC analysis which shows that more than 60% of investigations into robberies and two-thirds of cases of criminal damage and arson in England and Wales are left unsolved. The piece references that this theme was particularly stark in Greater Manchester where no suspect was identified in 85% of burglaries. All queries on this issue can be directed to the individual forces as they are responsible for decisions around the investigation of crimes. There is widespread coverage of the report on the investigation into why the police corruption trial looking into the response to the murder of Lynette White collapsed. The papers reference the key finding of the report which said that the causes were human error as opposed to a deliberate attempt to cover up any crime. Please see the Home Secretary’s comments on the findings below. You can read the whole report here. I welcome the publication of this report on the issues that led to the trial’s collapse in 2011. The report’s finding that human errors led to the collapse of the trail is deeply troubling, but I am pleased the causes have now been fully revealed. The Home Office will write to both the police and CPS to bring their attention to the report’s recommendations and every effort must be made to ensure they are acted upon.